lol, totally false! If you have Pure water (only H20) that means that it will FREEZE exactly at 0* celcius, and will BOIL exactly at 100* celcius. Any impurities in water can change that ever so slightly. I think the econ teacher said that because your car would weigh less. I bet (s)he thought it would save money because your engine would have to work a little bit less to get up to speed. I dunno if it's true, or true enough to save a decent amount of money. its not whats on the outside, its whats under the hood. Also, boycotting one company really won't do jack for the prices. I use to work at the main fuel farm for Phoenix, so bear with me because most other citys work the same way. Phx is supplied by 2 pipe lines. 1 from L.A., the other from Texas. ALL companies get the SAME GAS form the SAME refineries! What we would do is just monitor how much gas went into each tank, then switch it to a different companies tank. IE: we receive 100K through the pipeline, Exxon get 40K, Arco would get 30K and Quick Trip would get 30K . The difference comes into play with whatever additive each company puts in there gas (Techron, IQ, etc.). In other words, it doesn't matter if you boycott Exxon because the fuel may be coming from a Shell refinery, and every other station in the city has fuel from the same refinery. How the hell did loose the sticky, especially when gas is getting pricier by the week. The best thing I've ever done to my car (98' 2.4L Auto) to improve my gas mileage was getting the autotrans interceptor and adjusting it to a level I can deal with for daily driving. Having the transmission line pressure set about 35% higher then normal I got about an extra 3-4 miles/gallon. The only mod thats ever saved me money. Anyone else get these unexpected positive results from their autotrans interceptor? "The front looks great, if you didn't know its a Malibu behind it"
I was reading JBO and noticed all these FAQs spread all over. I want to create a whole website full of these useful FAQs. I would like your permission to copy your FAQ onto this website(its not created yet). You will get credit and I will send you a copy before it goes live so you can make sure you like the layout and the infomation and all. 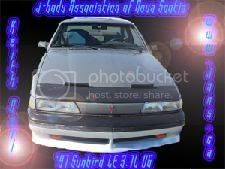 If you would agree to this I would be very thankful as Im sure the j-body community would too. I was thinking about doing the same thing, but I've been far too lazy. A compilation (with proper credit given) website would be a great idea .... make it clean, easy to read, and free --- it'll be a winner. The octane rating of gasoline tells you how much the fuel can be compressed before it spontaneously ignites. When gas ignites by compression rather than because of the spark from the spark plug, it causes knocking in the engine. Knocking can damage an engine, so it is not something you want to have happening. Lower-octane gas (like "regular" 87-octane gasoline) can handle the least amount of compression before igniting. It turns out that heptane handles compression very poorly. Compress it just a little and it ignites spontaneously. Octane handles compression very well -- you can compress it a lot and nothing happens. Eighty-seven-octane gasoline is gasoline that contains 87-percent octane and 13-percent heptane (or some other combination of fuels that has the same performance of the 87/13 combination of octane/heptane). It spontaneously ignites at a given compression level, and can only be used in engines that do not exceed that compression ratio. One question about that ... is how 110 octane works? If 87 is 87% octane and 13% heptane, and 93 is 93% octane and 7% heptane, then what the heck is 110 octane gas? I am not a chemical engineer, but that was along the lines I would have responded^. As for the added lead, that should be a big no-no. Especially since our cars are emmision controled vehicles and have catalytic converters. That lead will clog the cat up and cause a lot of particulates in the air. As for running on higher octane, run so only when the manfacturers recommends it. Running lower grade fuel on a engine that requires higher grade causes to retard the timing. It will not affect it immidiately, but if you practice it for the sake of being cheap, expect a harmful effect in the near future. I've found that if I run a few pounds higher on the air pressure in my tires my mileage improves by 2-3mpg. Granted the ride is a bit stiffer, but I'm not talking much, maybe running 30-32 instead of 26 that the sticker on the door recommends. (30 Jun 03) Car is done for the time being. Building the bike is more important now. take a dump and a leak before you take off so that you don't add the extra weight to your car! Here is an article I found to help out. Record high gas prices don't have to take a huge chunk out of your budget. There are ways to save on gas, area mechanics say. Driving more efficiently, keeping your car in shape, planning and combining trips and possibly choosing a more efficient vehicle can help reduce the amount of gas you use, said Brian Shirley, president of Quality 1 Auto Centers, located at 901 W. Lake next to Kmart in the Evergreen Square. Tuneups, regular oil changes and car maintenance checks improve performance as well as gas mileage, he said. By following the manufacturer's recommendations in your owner's manual, you should avoid fuel economy problems caused by worn spark plugs, dragging brakes, low transmission fluid or the transmission not going into high gear, according to the U.S. Environmental Protection Agency's Office of Mobile Sources. "A good tuneup goes a long way," Shirley said. Fixing a car that is noticeably out of tune or has failed an emissions test can improve its gas mileage by an average of 4.1 percent, though results vary on the kind of repair and how well it's done, according to the U.S. Department of Energy. It's also important to check and replace air filters regularly, Shirley said. Replacing a clogged air filter can improve your car's gas mileage by as much as 10 percent, according to the Department of Energy. A car's air filter keeps impurities from damaging the inside of the engine. Not only will replacing a dirty air filter save gas, it will protect your engine, Shirley said. Keeping your tires properly inflated can improve your gas mileage as well, said Bruce Kent, owner of Benson's Automotive Service at 2453 N. Knoxville Ave. in Peoria, who has been in the industry 32 years. Tires lose an average of three pounds of air a month, so it helps to check them monthly, Kent said. "General maintenance on your vehicle can help your car run to its maximum capability," Kent said. Periodic wheel alignments also are important, he said. "That's another thing that people never, and I mean never seem to do," Kent said. "But it only takes one sixteenth of an inch out of alignment to cause tire wear." Driving sensibly, and avoiding aggressive driving such as speeding, rapid acceleration and braking, can save gas too, Shirley said. (C) 2004 Peoria Journal Star. 1. There is less trafic on the road so you are less likely to use your breaks or have to stop at stop light. 2.you can coast down hills at idle and pick up some extra speed, since you don't have to keep a constant speed to keep from running into the guy in front of you or getting the guy behind you mad. 3. There is generaly less wind at night. Temperatures tend to stabalize and the wind is at a minimum. Less chance for a headwind or side-wind to slow you down. Of course this is only recomended for the night people like me that can drive safely throughout the night. If you tend to get tired behind the wheel, lleave during the day. "ashes to ashes and dust to dust i might leave in a body bag but never in cuffs"
All the other tips here are good but your right foot is the biggest factor in mileage. I check my milage damn near every tank I get. ANd I have concluded that I get 2-3 more MPG if I fill up at half a tank instead of letting it get close to empty. Also. Whats everyones opinion on header giving more MPG?